This is a fantastic, easy, quick recipe that we absolutely love because you feel like you are filling your body up with really healthy food but it is still extremely tasty. And when I say quick, it is seriously quick, as in max 10 mins of cooking time (perhaps 20 mins of prep) so you can whip it up quite easily at the last minute. You can use any vegies you like to accompany the beef, for example, shitake mushrooms work really well. Rice (we use brown rice but you can use whichever rice you prefer). 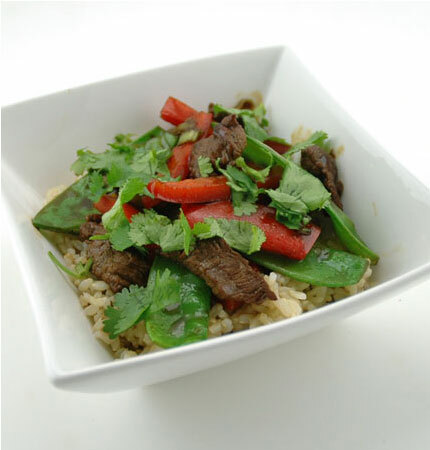 Start cooking your rice now so that it is ready by the time the stir-fry is done. Crush the ginger and garlic in a mortar and pestle and chop up your vegies. Trim the spring onions, wash thoroughly and chop finely. Slice the beef into thin strips. Mix up the oyster and soy sauces in a bowl with the palm sugar, sesame oil and water. Chop up the fresh coriander. To a wok over high heat add a couple of tablespoons of oil, garlic and ginger and keep stirring until the paste smells fragrant, and then add the chopped spring onions and cook for 1 minute. Remove to a bowl and cover. Heat the wok again, add some more oil and the beef and stir for a minute or so until the beef is almost cooked through. Add the vegies, garlic and ginger and the sauces and stir for a couple of minutes until everything is cooked through and all the ingredients are well mixed. Taste and add a bit soy sauce to season if necessary. Add the chopped coriander, stir through and serve with the rice. We love our vegies nice and crispy, if you like them a bit more well cooked then you can always cook them for a few minutes before you start cooking the stir-fry.